Book a run in Singapore. Run with a local in Singapore. Choose from our suggested runs or customise a run yourself - further details and availability below. All our tours are free, guides work based on tips. CUSTOMISE A RUN - you decide! On the Marina Bay running tour, join us for a 6 km (4 mile) guided run around the bay that is synonymous with Singapore. This is the heart of Singapore, where old meets new. It’s the ideal place to run in the city, and we’ll show you the highlights of Singapore, including: Boat Quay, Gardens by the Bay and the iconic Marina Bay Sands. 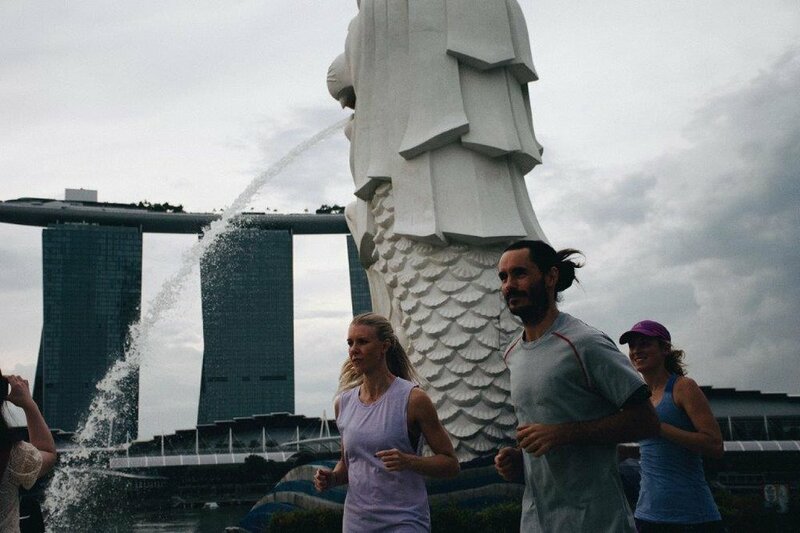 We love to run in Singapore, and want to show you the best sights when you run here too. The Marina Bay Tour tour is run at a pace that is comfortable for you. Great Tour of Singapore with Hudson! "I contacted Hudson last minute upon arriving into Singapore. He got back to me pretty quickly to set up a private run the next morning. I had only 2 days in Singapore and felt he gave me a pretty comprehensive intro to the city in the 4 mile run. He was very good to let me pace the run and knew where to find the water fountains (much needed in the humidity of Singapore!) I highly recommend reaching out to Hudson if you're in the area" - TripAdvisor. If these timings do no suit you, no problem, we often have people who can't meet the regular timings. Where we can, we'll be happy to set up a tour outside these times. IS THE RUNNING TOUR REALLY FREE? Yes, the running tours are free, however we rely on tips to keep our guides taking tours. You may tip as little or as much as you like, but if you enjoyed the tour, we recommend around 15-20 SGD per person to keep the runs going. While we prefer SGD, we will accept tips in AUD, USD or EUR. We meet outside the Starbucks in front of Exit E for Clarke Quay MRT stop on Eu Tong Sen Street / New Bridge Road. Look for the ugly 90's multicoloured mural! 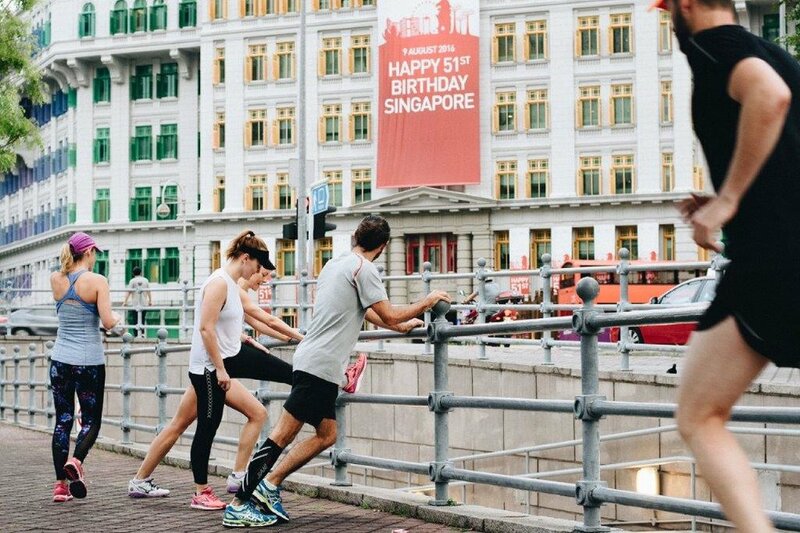 Each Singapore running tour has its own days and times, check the schedule above for details . These times are selected to avoid as best as possible Singapore's humidity, heat and high rainfall for visitors, but if you would like to run at another time, contact us and we'll arrange a time for you whenever we can. We will not typically cancel for rain unless there are clear indications of local thunderstorms. We will notify runners who have registered with us if and when this occurs with as much notice as we can. Please try to arrive at the meeting point 10 minutes before the allotted start time. In doing so you ensure that the tour can leave on time and subsequently you get more time with your guide. If you arrive late, you risk us leaving without you! You may bring wallets, phones, keys and other small personal effects and the guide will carry them for you in a waterproof bag. There is an opportunity for a drink of water and bathroom break part way and water can also be bought in the shopping centre at the end of the run so we ask that you don't bring water bottles unless you're willing to carry them on your run. I'M NOT A GREAT RUNNER, WILL THAT BE A PROBLEM? No, we cater for a wide range of athletic ability. We take a number of stops over the 6 km distance, taking about an hour on average, so someone who is comfortable to run 4-5 kms without stopping is unlikely to have any issues. In addition, there are multiple opportunities to short cut the route, so you may walk sections and we can catch up with you again to continue the tour. We will assess the spread of ability in the group and work something out to make sure everyone gets something out of it.